Cognitive functions, also referred to as psychological functions, as described by Carl Jung in his book Psychological Types, are particular mental processes within a person's psyche that are present regardless of common circumstance. This was a concept that served as one of the conceptual foundations for his theory on personality type. In his book, he noted four main psychological functions: thinking, feeling, sensation, and intuition. He introduced them with having either an internally focused (introverted) or externally focused (extraverted) tendency which he called "attitudes". Jung originally conceived of the model in which four cognitive functions combine to form different psychological types. This was done in his work Psychological Types, published as the sixth volume in The Collected Works of C. G. Jung. Jung posited that the functions formed a hierarchy within a person's psychological dynamics—the most developed function is referred to as the "dominant", with the remaining three filling the roles as "auxiliary" and "inferior" functions. The four basic functions were thinking, feeling, intuition, and sensation. The concept of introversion and extraversion were also conceived by Jung, and were used in conjunction with the four functions. Extraversion: "a strong, if not exclusive, determination by the object." Consciously, in an extravert, the four basic cognitive functions follow the extraverted 'general attitude of consciousness': "Now, when the orientation to the object and to objective facts is so predominant that the most frequent and essential decisions and actions are determined, not by subjective values but by objective relations, one speaks of an extraverted attitude. When this is habitual, one speaks of an extraverted type. If a man so thinks, feels, and acts, in a word so lives, as to correspond directly with objective conditions and their claims, whether in a good sense or ill, he is extraverted." Introversion: "a turning inwards of the libido, whereby a negative relation of subject to object is expressed. Interest does not move towards the object, but recedes towards the subject." Consciously, in an introvert, the four basic cognitive functions follow the introverted 'general attitude of consciousness'. "Everyone whose attitude is introverted thinks, feels, and acts in a way that clearly demonstrates that the subject is the chief factor of motivation while the object at most receives only a secondary value." The difference between extraversion and introversion comes from the source of the decisive factor in forming motivation and developing ideas, whether it is objective (i.e. the external environment) or subjective (the collective unconscious, or "processes inherent in the psyche"). When discussing function types, Jung ascribed movements of the libido in both directions for each function in each function type, but with one direction being that final judge. The four basic psychological functions, thinking, feeling, sensation, and intuition are "basic functions" that can be briefly defined as follows. According to Jung, thinking is "that psychological function which, in accordance with its own laws, brings given presentations into conceptual connection." Jung also made distinction between active and passive thinking: "The term 'thinking' should, in my view, be confined to the linking up of representations by means of a concept, where, in other words, an act of judgment prevails, whether such act be the product of one’s intentions or not. The faculty of directed thinking, I term 'intellect'. The faculty of passive, or undirected, thinking, I term 'intellectual intuition'." The former, active thought, is what Jung considered a 'judging function'. It deals with the mechanical nature of objects and values impersonal logic. "Apart from the qualities I have mentioned, the undeveloped functions possess the further peculiarity that, when the conscious attitude is introverted, they are extraverted and vice versa. One could therefore expect to find extraverted feelings in an introverted intellectual..."
Extraverted thinking is the thinking function that is objective (being extraverted) and typically employs inductive reasoning. Extraverted thinking often places information such as facts in high order; Te is a process that is concerned with organisation and hierarchy of phenomena. Although Te prefers data that is concrete and empirical in nature, the information only needs to be external and other phenomena that cannot be reduced to some form of objective nature will be ignored by the Te function. Te is seen as employing a level of goal-setting and results within its function properties, taking steps towards the actionable. "In accordance with his definition, we must picture a, man whose constant aim -- in so far, of course, as he is a [p. 435] pure type -- is to bring his total life-activities into relation with intellectual conclusions, which in the last resort are always orientated by objective data, whether objective facts or generally valid ideas. This type of man gives the deciding voice-not merely for himself alone but also on behalf of his entourage-either to the actual objective reality or to its objectively orientated, intellectual formula. By this formula are good and evil measured, and beauty and ugliness determined. All is right that corresponds with this formula; all is wrong that contradicts it; and everything that is neutral to it is purely accidental." Introverted thinking is the thinking function that is subjective (being introverted) and typically employs deductive reasoning. Ti is concerned with the general idea of phenomena and will attempt to explain a logical problem with subjective information. It contains a set of 'logical principles' that wishes to 'abstract' a system or structure to its bare principles. Hence, Ti is highly analytical; it also enforces a level of independence and individuality within its cognitive framework. Ti is seen as purely analytical and points to the principles from which facts are derived. "Just as Darwin might possibly represent the normal extraverted thinking type, so we might point to Kant as a counter-example of the normal introverted thinking type. The former speaks with facts; the latter appeals to the subjective factor. Darwin ranges over the wide fields of objective facts, while Kant restricts himself to a critique of knowledge in general. But suppose a Cuvier be contrasted with a Nietzsche: the antithesis becomes even sharper." "The introverted thinking type is characterized by a priority of the thinking I have just described. Like his [p. 485] extraverted parallel, he is decisively influenced by ideas; these, however, have their origin, not in the objective data but in the subjective foundation. Like the extravert, he too will follow his ideas, but in the reverse direction: inwardly not outwardly. Intensity is his aim, not extensity. In these fundamental characters he differs markedly, indeed quite unmistakably from his extraverted parallel. Like every introverted type, he is almost completely lacking in that which distinguishes his counter type, namely, the intensive relatedness to the object." Jung defined feeling as "primarily a process that takes place between the ego and a given content, a process, moreover, that imparts to the content a definite value in the sense of acceptance or rejection [...] Hence feeling is also a kind of judging, differing, however, from an intellectual judgment, in that it does not aim at establishing an intellectual connection but is solely concerned with the setting up of a subjective criterion of acceptance or rejection." Also Jung made distinctions between feeling as a judging function, and emotions (affect): "Feeling is distinguished from affect by the fact that it gives rise to no perceptible physical innervations." "Apart from the qualities I have mentioned, the undeveloped functions possess the further peculiarity that, when the conscious attitude is introverted, they are extraverted and vice versa. One could therefore expect to find extraverted feelings in an introverted intellectual""
Extraverted feeling (Fe) is the feeling function that is primarily concerned with connection and commonality to others. Since it is extraverted and objective, it encapsulates the system of 'value' outward in the form of common courtesy and etiquette. Fe can be seen as accommodating and presents to mind a picture of a motherly figure. Overall, Fe is concerned with phenomena to be harmonious with its external environment. Jung writes of extraverted feelers as those where feeling "loses its personal character -- it becomes feeling per se; it almost seems as though the personality were wholly dissolved in the feeling of the moment. Now, since actual life situations constantly and successively alternate, in which the feeling-tones released are not only different but are actually mutually contrasting, the personality inevitably becomes dissipated in just so many different feelings." Introverted feeling (Fi) is the feeling function that is primarily concerned with authenticity, personal values and individuality. This is because it is focused inwardly and because of this, a dominant or auxiliary user of Fi can be quite reluctant to share their values, or be indifferent towards causes that are of no interest to the Fi user. Fi can be seen as individualistic and non-conformist. Fi is often seen as very hard to elucidate since so little of it is openly displayed. Jung writes of feeling in introverted feelers: "[Introverted feeling] is continually seeking an image which has no existence in reality, but which it has seen in a kind of vision. It glides unheedingly over all objects that do not fit in with its aim. It strives after inner intensity, for which the objects serve at most as a stimulus. The depth of this feeling can only be guessed—it can never be clearly grasped. It makes people silent and difficult of access; it shrinks back like a violet from the brute nature of the object in order to fill the depths of the subject. It comes out with negative judgments or assumes an air of profound indifference as a means of defence." Jung presented sensation as "that psychological function which transmits a physical stimulus to perception. [...] not only to the outer stimuli, but also to the inner, i.e. to changes in the internal organs. Primarily, therefore, sensation is sense-perception, i.e. perception transmitted via the sense organs and 'bodily senses' (kinaesthetic, vaso-motor sensation, etc.)." Also, since the process of conscious perception is a psychological phenomenon representing a physical phenomenon, and not the physical phenomenon itself, he adds: "On the one hand, it is an element of presentation, since it transmits to the presenting function the perceived image of the outer object; on the other hand, it is an element of feeling, because through the perception of bodily changes it lends the character of affect to feeling." Extraverted sensation is the sensing function that perceives phenomena in a realistic and concretist way. Like extraverted thinking, Se concerns itself with the facts; however, this is not for sake of logical fulfillment or completion, but for sake of receiving the highest physiological pleasure as possible. Extraverted sensation has little time for hidden meanings—most phenomena are self-explanatory to the Se psyche. Since an Se type's source of reward gravitates around perceiving and feeling external phenomena, a user of Se often has a good sense of aesthetic—whether this be the taste of food, or a new trend in clothing. Due to this mindset, Jung writes of the Se type's morality, "For true enjoyment, [the extraverted sensation type] has its own special morality, its own moderation and lawfulness, its own unselfishness and devotedness. It by no means follows that he is just sensual or gross, for he may differentiate his sensation to the finest pitch of æsthetic purity without being the least unfaithful, even in his most abstract sensations, to his principle of objective sensation." Introverted sensation is the sensing function that perceives phenomena in such a way as extraverted sensation does above, but in a subjective manner. As Jung notes that all introverted functions focus on the past, Si is said to compare phenomena with past experiences (this has never been said by Jung himself; it is a common internet misconception) and is very detailed in what it detects, thus creating a level of conscientiousness and procedure in their work. It is chiefly concerned with a meticulous cataloging of physical experiences and recalling them when the user perceives similarity in their subjective experiences of current reality. It wants things to be pinned down and concluded, mistrusting novel possibilities which explains the adherence to traditional ways. Intuition is also presented as a basic psychological function as hunches and visions provide an alternative means of perception to sensation: "It is that psychological function which transmits perceptions in an unconscious way. Everything, whether outer or inner objects or their associations, can be the object of this perception. Intuition has this peculiar quality: it is neither sensation, nor feeling, nor intellectual conclusion, although it may appear in any of these forms." Extraverted intuition is the type of intuition that introspects in an extraverted and thus, objective manner—thus, the extraverted intuitive type is the 'brainstormer', one who introspects many possibilities for certain situations. Because of this, the extraverted intuitive is known to have quite flighty judgment and a lack of decisiveness. Unlike its extraverted irrational counterpart, extraverted sensation, extraverted intuition looks for not what is but what may be. Ne operates together with Si, forming the Ne-Si axis. It perceives possibilities in the external world, between objects (Ne) and these connections are synthesised from the subjective physical (concrete) impressions (Si) of the object, hence owing to the quirkiness and seemingly wild nature of their associations to an observer (higher Ne users) since their physical impressions of objects are subjective and hence obscured from objective view of physical reality (Se). Ne-Si can be termed as examining. Introverted intuition is the intuition that acts in an introverted and thus, subjective manner. Introverted intuition is a function that is often described as hard to explain, due to its highly inward and intangible nature. The introverted intuition type has the ability to 'thread' multiple sources of phenomena into a certain view or vision. This is contrary to its opposite, extraverted sensation, which sees things as they come and in a very concrete manner. The lack of this extraverted sensation can often make the Ni type a very dogged character, ignoring what is apparent and focusing on their synthesised worldview. Unlike its introverted irrational counterpart, introverted sensation, introverted intuition looks not to indulge in a meticulous cataloging of physical experiences and recalling them when the user perceives similarity in their subjective experiences of current reality (since Si doesn't objectively experience reality unlike Se) but always looks for future implications of the observable reality and how one chain of event leads to another. It always goes beyond the concrete data where Si does not. Where Ne perceives breadth, Ni compensates this with depth in its perceptions. Ni operates together with Se, forming the Se-Ni axis. It observes the physical properties of objects vividly (Se) and perceives possibilities in the inner world (Ni), where these perceptions are subjective and diluted by the subject's biases hence, these associations are personal to the subject and in no way represent reality, but an abstract interpretation. This gives higher Ni users intense focus and an air of mysticism. Ni dominants always go beyond the objective physical concreteness of objects and find their interpretation more interesting and delicious. Ni-Se can be termed as conjecturing. Isabel Myers, an early pioneer of psychometric testing whose ideas remain controversial within psychology, formalised these ideas and proposed that the mixture of types in an individual's personality could be measured through responses to a personality test she devised along with her mother, Katharine Cook Briggs, the Myers-Briggs Type Indicator. In this model, four "dichotomies" are defined, each labelled by two letters (one for each of the opposites in question), as shown by the emboldened letters in the table. Individuals' personalities fall into sixteen different categories depending on which side of each dichotomy they belong to, labelled by the four applicable letters (for example, an "ESFP" type is someone whose preferences are extraversion, sensing, feeling and perceiving). Myers interpreted Jung as saying that the auxiliary, tertiary, and inferior functions are always in the opposite attitude of the dominant. In support of Myers' (and/or Briggs') interpretation, in one sentence Jung seems to state that the "three inferior" functions of an (extreme) extravert are introverted. The "most differentiated function is always employed in an extraverted way, whereas the inferior functions are introverted". Many, however, have found Jung's writing to be ambiguous, and those who study and follow Jung's theories (Jungians) are typically adamant that Myers is incorrect. Jungians interpret Jung as explicitly stating that the tertiary function is actually in the same attitude as the dominant, providing balance. More recently, typologists such as John Beebe and Linda Berens have introduced theoretical systems in which all people possess eight functions—equivalent to the four functions as defined by Jung and Myers but in each of the two possible attitudes—with the four in the opposite attitude to that measured known as the "shadow functions", residing largely in the unconscious. There is controversy even within the Center for Applications of Psychological Type (CAPT), co-founded by Myers, regarding the attitude of the tertiary relative to the dominant. "The MBTI Qualifying Program", a binder given out during official training, puts the tertiary in the opposite attitude to the dominant on page 13; however, The Manual, which gives official instructions on how to use the test, has the tertiary in the same attitude on page 31. Charles Martin, former vice president of research at CAPT, writes the following on page 22 of the binder, "In what attitude is the tertiary? Isabel Myers read Jung to say that the auxiliary, tertiary, and inferior are all in the same attitude and opposite the dominant. Others (Harold Grant) read: tertiary is in the same attitude as the dominant." To summarize Jung's views, as discussed in Psychological Types and maintained until his death, Jung posited that each individual follows a "general attitude of consciousness" where every conscious act is directed by the tendency to follow introversion for introverts and extraversion for extraverts. Jung's definition of the general attitude was not limiting the individual from experiencing the opposing attitude, but offers the "decisive determination". The primary, or most developed, differentiated, and conscious function, is entirely positioned in the service of the conscious attitude of introversion or extraversion, but even if all other functions can be conscious and made to follow the general attitude, they are of less differentiation and are hence strongly affected by the opposing attitude of the unconscious. Later in the book, Jung describes the auxiliary function as being capable of some significant development or differentiation, if it remains less differentiated of that of the primary. His views on the primary and auxiliary functions both being of enough differentiation to be considered conscious and set aside with the primary as opposed to the most inferior two functions can be noted as early as Psychological Types. "For all the types met with in practice, the rule holds good that besides the conscious, primary function there is a relatively unconscious, auxiliary function which is in every respect different from the nature of the primary function." "From these combinations well-known pictures arise, the practical intellect for instance paired with sensation, the speculative intellect breaking through with intuition, the artistic intuition which selects. and presents its images by means of feeling judgement, the philosophical intuition which, in league with a vigorous intellect, translates its vision into the sphere of comprehensible thought, and so forth." "I distinguish these functions from one another because they cannot be related or reduced to one another. The principle of thinking, for instance, is absolutely different from the principle of feeling, and so forth." The tables below give different theorists' ideas about personality types in terms of "cognitive functions". Carl Jung developed the theory of cognitive processes in his book Psychological Types in which he defined only four psychological functions which can take introverted or extraverted attitudes, as well as a judging (rational) or perceiving (irrational) attitude determined by the primary function (judging if thinking or feeling, and perceiving if sensation or intuition). He used the terms dominant, auxiliary, and inferior. Each individual follows a "general attitude of consciousness" in which the function is conscious. The more conscious a function is, the higher the tendency and potential it has to develop. The less differentiation is hence strongly affected by the opposing attitude of the unconscious,[clarification needed] and manifest in "happening" to the person and not under conscious control. [clarification needed] Therefore, there is a significant difference between Jung and the MBTI regarding the orientation of the functions. Also, there is a difference between Jung and the MBTI regarding the designation of "inferior" function. While the MBTI clearly designates only the fourth function as the inferior, Jung uses a more flexible definition. "As a consequence of this one-sided development, one or more functions are necessarily retarded. These functions may properly be called inferior ..."
The following table is a summarized model of Jung's conception of personality types based on the four functions, introversion, and extraversion. 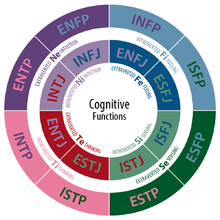 A diagram of the cognitive functions of each Myers-Briggs type. A type's background color represents its Dominant function, and its text color represents its Auxiliary function. Isabel Myers created the original type table. In her table, diametrically opposite personality types (that is, those with no traits in common among the dichotomies) are separated by one block along diagonals. Though John Beebe has not published a type table, the format that Isabel Myers devised can also be applied to his theory. Beebe describes the different cognitive functions' role in the overall personality in terms of various mythic archetypes. Just as in Myers's table, personality types whose primary four functions are completely opposite are separated by one block along diagonals. The same does not apply to the four "shadow" functions, however. John Beebe's model is based on Jung's theory of the collective unconscious, which is considered to be unscientific. The layout of Linda Berens's type table is unique and her terminology differs from that of Beebe; however, the ordering of cognitive processes in her and Beebe's models are the same. Lenore Thomson offers yet another model of the cognitive functions. In her book, Personality Type: An Owners Manual, Thomson advances a hypothesis of a modular relationship of the cognitive functions paralleling left-right brain lateralization. In this approach the Judging functions are in the front-left and back-right brain and the Perception functions in the back-left and front-right brain. The extraverted functions are in the front of the brain, while the introverted functions are in the back of the brain. The order of the cognitive functions are then determined not by an archetypal hierarchy (as supposed by Beebe) but by an innate brain lateralization preference. ^ a b c d e f g h i j k l m Jung 1971, chpt. 11. ^ a b c d e f g h Jung 1971, chpt. 10. ^ Jung, C. G. (1971) . Psychological Types. Collected Works of C. G. Jung. 6. Translated by Adler, Gerhard; Hull, R. F. C. Princeton University Press. ISBN 978-1-4008-5086-0. JSTOR j.ctt5hhqtj. ^ Jung 1971, appx. 2. ^ a b "Why Te is Inductive and Ti is Deductive". CelebrityTypes. CelebrityTypes International. 16 April 2013. Retrieved 10 June 2015. ^ Smith, Ryan (23 January 2014). "Jung in Plain Language, Part 1: Te and Ti Note: paywall". CelebrityTypes. CelebrityTypes International. Retrieved 10 June 2015. ^ "Te, Fi, and Fe as Social Functions | CelebrityTypes". www.celebritytypes.com. Retrieved 2015-06-10. ^ a b Jung, Carl G. (December 2010). "Jung's Portrait of the ESTP / ESFP Types". CelebrityTypes. CelebrityTypes International. Retrieved 11 June 2015. ^ a b c Sharp, Daryl (1987). Personality Types – Jung's Model of Typology (PDF). Inner City Books. ISBN 978-0-919123-30-4. ^ "Introverted Sensing". CognitiveProcesses.com. Retrieved 7 September 2015. ^ "Cognitive Functions at a Glance". CelebrityTypes. CelebrityTypes International. Retrieved 7 September 2015. ^ a b "Illustrating Function Axes". ^ "The Psychological Aesthetics of Ne". CelebrityTypes International. CelebrityTypes. 12 October 2013. Retrieved 7 September 2015. ^ a b Beeson, Eric. "Cognitive Function Based Personality Type Quiz". Archived from the original on 11 March 2015. Retrieved 7 September 2015. ^ "Introverted iNtuiting - (Ni)". CognitiveProcesses.com. Retrieved 7 September 2015. ^ Pierce, Michael (28 October 2014). "Pierce Presents: INTJ". CelebrityTypes. CelebrityTypes International. Retrieved 7 September 2015. ^ Jung 1971, chpt. 5. ^ a b c Jung 1971, chpt. 8. ^ Myers, Isabel Myers  (1995). Gifts Differing, Palo Alto, C.A. : Davies-Black Publishing. ISBN 0-89106-074-X. ^ Domhoff, G. William (23 September 2000). ""Moving Dream Theory Beyond Freud and Jung. Paper presented to the symposium "Beyond Freud and Jung? ", Graduate Theological Union, Berkeley, CA"". Myers, Isabel Myers  (1995). Gifts Differing, Palo Alto, C.A. : Davies-Black Publishing. ISBN 0-89106-074-X. Thompson, Henry L (1996). Jung's Function-Attitudes Explained, Watkinsville, GA.: Wormhole Publishing. ISBN 978-1-887278-01-0. Nardi, Dario (2005). "8 Keys to Self-Leadership From Awareness To Action", Huntington Beach, CA :Unite Business Press. ISBN 978-0-9719326-1-6. Thomson, Lenore (1998). Personality Type: An Owners Manual, Boston & London: Shambhala Publications, Inc. ISBN 1-57062-987-0. This page was last edited on 16 December 2018, at 12:44 (UTC).